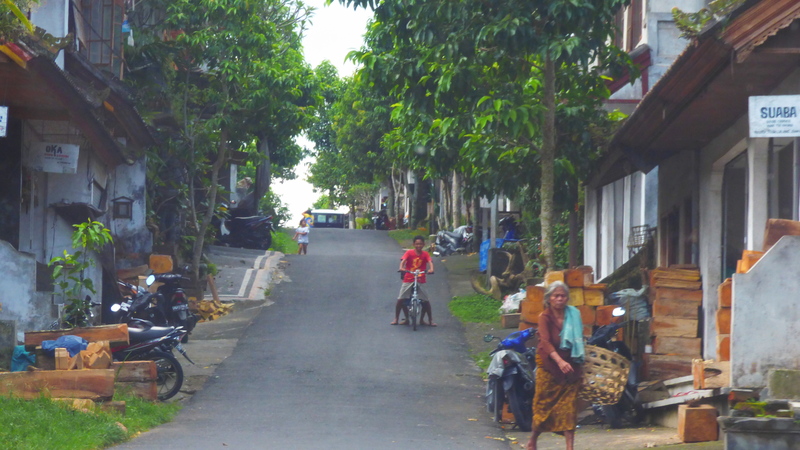 Today we decided that we needed to “go it alone” in Bali, and this can often be the most frightening part of travelling – stepping bravely out into the local area, getting one’s bearings and trying to make it home safely in one piece; a particularly challenging task given the congested traffic and lack of pedestrianised areas in Bali. We amicably shared the road with cars, tour buses, vans and hundreds of scooters, and while we were initially nervous about that, we discovered that everyone showed a great deal of care and concern for each other. The primary concern of the people of Bali seems to be that everyone needs to get on their way safely and arrive at their destination safely. Friendly toots to say “I’m here, take care, I’m coming past” were regular during our trek around the streets of Seminyak. Although taxis mostly tooted for a potential fare: “Hey you, Australia! It’s hot, you’re clearly struggling, how about a ride in my air conditioned van?” As the humidity set in and my hair went completely “fro”, it was a very tempting offer! No, it’s not a one way road…add another car, five scooters, two taxi vans and a handful of tourists and that’s about right! We met a few street sellers on our walkabout but had decided to avoid all marketplaces on this trip. While these sellers were hawking their wares, we found them much nicer to deal with than those in Patong Beach who followed and nagged their customers for at least three blocks. 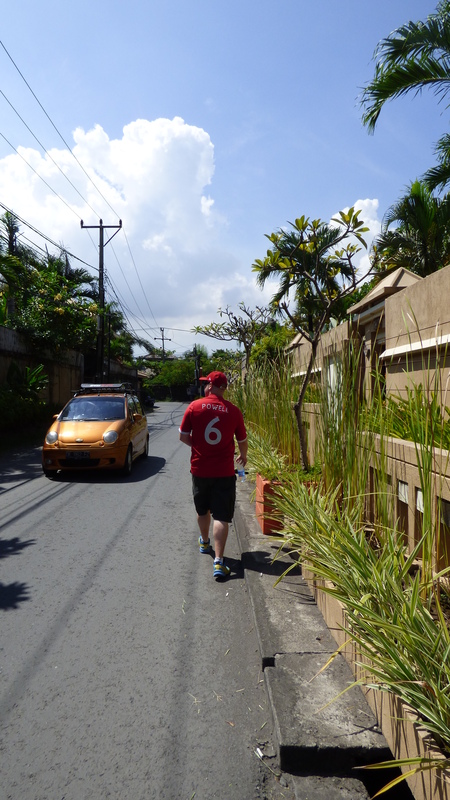 The advice we had read from a number of travel sites prior to arriving in Bali (don’t make eye contact, don’t speak to them, just ignore them….a bit like how Roger is with car salesmen!) was quickly cast aside by us. We found this advice made us very dismissive and extremely rude, and instead we discovered that a friendly hello, smile and polite no thank you was enough. There was only one occasion where a persistent street seller practically climbed in next to Roger in the back seat of our mini-van, thrusting his goods in his face and saying “Only $1! Only $1!” After many firm no-thank-yous, and Roger on the point of grabbing his carved ivory horn and ramming it somewhere unpleasant, our guide Nowa came to our rescue and politely told him to sling his hook. Discussing this in the back of the van as we drove away (Wow $1, that was pretty cheap for such a nice horn! ), Nowa told us that actually no, it was a ploy, and the goods would probably be more in the range of $100. We found the chaps on the scooters who pulled up alongside us, and the men hanging around Seminyak Square selling dubious looking scratchy tickets, to be the most deserving of any disdain. These gents were annoying and less likely to give up if you didn’t keep walking. However, as a female, I was less affected by their solicitations. I found that their ‘pitch’ was for Roger’s benefit. They always addressed him and never bothered with me. It could have been they were terrified of my hair, but more likely it was because of the gender roles in their culture. Roger, as the man, would be considered to be the alpha male of our little pack, the ‘trouser wearer’, and the one carrying the wad of cash in the aforementioned trousers. Little did they know that all Roger was carrying in his wallet were two duplicate Midland library cards, his Dome coffee voucher from his Sunday morning lyrca clad bike rides and a receipt from the Pound Shop from England dated July 2007. In fact, Miss Moneypenny here was the one with the cash and truth be told, she was a pretty soft touch when it came to parting with her money……but they let her walk on by. However, I didn’t mind being ignored. It left me to smile and wave at people going about their daily chores, including workers on a nearby local building site who turned out to be an extraordinary thing to watch. The site was just metres from our villa and in a stiffling heat, the men worked hard lugging tiles and buckets of cement up bamboo scaffolding to a third, fourth or fifth storey of a new villa complex. No protective clothing, no safety harnessing. They would offer a friendly wave and a smile if it was forthcoming from us first. One young man even began dancing gleefully (and precariously for that matter) on the edge of the fourth floor slab, so thrilled was he at the attention he was receiving! Such happy, friendly people. I was also considerably impressed to see a woman holding her own amongst the predominantly male work force, and stood watching slackjawed as she climbed a bamboo ladder with a bag of clay balanced perfectly on her head. Respect sistah! 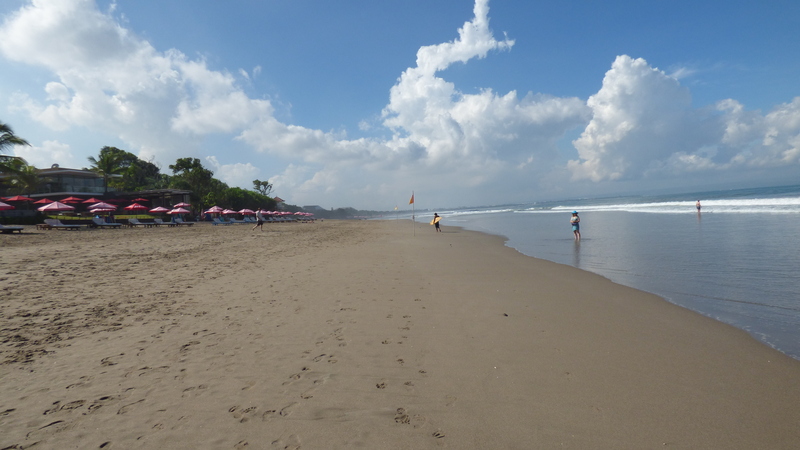 The beach at Seminyak was beautiful, although we had heard the beaches in Bali were no good, terrible in fact! Just another rumour to quash I guess. Perhaps they are not so good down in Kuta? And it was completely empty while we there but for a few swimmers, beach walkers and surfers. We managed to find a great little place for a traditional Balinese massage called Cool Spa. The girls here were fantastic, cleaning our tired feet for us then rubbing aromatherapy oils into our tense, work weary muscles for a full 90 minutes. And for a very reasonable AUD$21. For dinner we wanted to try a burger bar that had been listed as the Number 1 place to eat in Seminyak on Trip Advisor called Wacko Burgers. We walked past it three times before we actually found it, tucked away at the back of a market place. It really was as delicious as all the reviews stated. The sauce…..there was something about the wacko sauce! And for AUD$5 we got a very filling burger, salad and fries. Perfect! Even though we had to sit outside dripping in the heat because the air-conditioned interior was full. We finally arrived back at our villa and fell immediately into the pool. It had been a hot HOT day, albeit very quiet and relaxing. But that was why we had chosen Bali in the first place for our holiday. We needed to get away from Perth, and we wanted to be pampered with massages and our own pool. 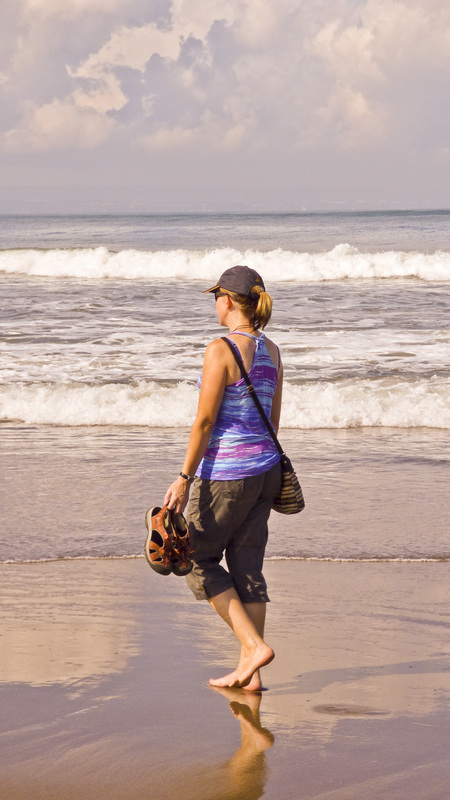 We were certainly making the most of it, and we had found our way around Seminyak just fine. And as an added bonus, tonight we found the mosquito coil in our villa – only three nights after we arrived! Although, we had survived the mossies beautifully so far: only three bites between us to scrat at. Feeling that tomorrow we needed to get back out into the wilds of Bali, we booked a white water rafting trip with a company called Alam. They had been recommended to us by Nowa the day before. It had been a while since I had balanced on the inflated sides of a raft and faced the white water of nature….Austria in 2003 I believe. As for Roger, well, he’d never done it before. He was so excited he could barely sleep and cursed the fact that he hadn’t pushed Santa harder for a Go Pro for Christmas!